Jamaica is quite famous for their spicy meals. ‘Jamaican Jerk’ seasoning and spicy beef patties have won the hearts of people around the world and loved by visitors to the island. So while you can grab a pre-packaged or frozen duplicate of these tasty Jamaican foods at your local, once you have tasted the traditionally made foods of Jamaican street vendors you will realize there is just no comparison. 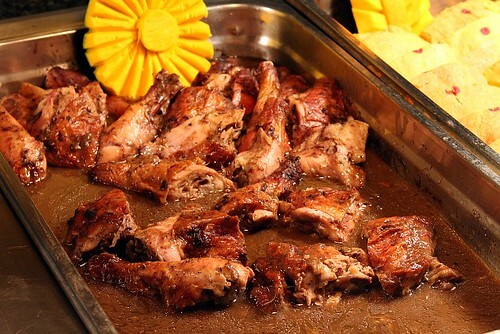 Check out what traditional dishes you should try while staying in Jamaica. Most likely you have tried some kind of version of the Jamaican beef patty, but like usual nothing beats the original. The outer shell is a flaky crust which is then filled with a variety of different filling (looks very similar to a turnover). And while it is called a ‘beef’ patty there can be a variety of fillings like beef, chicken, shrimp, lobster and even fish. This is the most staple Jamaican meal you will find and is often pared with tasty cocoa bread. Jerk chicken is pretty popular in the UK and US, but wait until you get to try the real Jamaican Jerk Chicken! You may also be able to find jerk beef, shrimp and tofu, but the Jamaican jerk chicken still continues to be the most popular choice. The spice is made up of a combination of cinnamon, cloves, ginger, thyme, garlic, pepper and nutmeg, making the Jamaican jerk chicken a great dish with a unique flavour of its own. Grabbing a taste of Jamaica’s national dish is a must; Ackee and Saltfish is very popular for visitors because of the uniqueness of the meal. The seed pod of the Ackee fruit is mixed with saltfish or sometimes codfish as well as boiled bananas, dumplings or roast breadfruit. 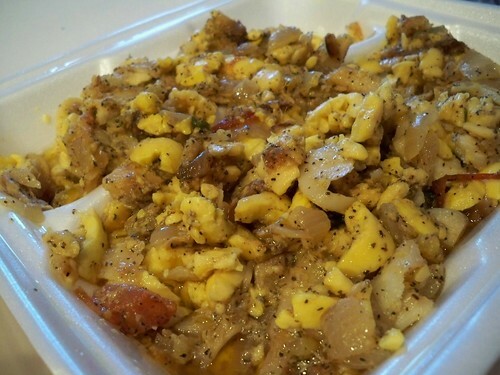 You will find most Jamaicans eating this dish for breakfast. It almost looks like scrambled eggs when cooked. A lot of Jamaican food is also spiced up with the savoury spice of curry. Curried-spiced goat is a traditional dish that is usually eaten during important family events or functions. Served with rice and peas as a more contemporary alternative, curried goat or chicken can also include coconut or raisins for a sweet and tangy option. You will most likely see many Jamaican families raising goats, for the sole purpose of saving a goat for special occasions like a holiday or even funeral to make curry goat for guests. If you happen to visit during a traditional Jamaican holiday you will for sure find a large variety of curried chicken or goat. This is a very traditional, yet versatile, dessert for the Jamaican people. Breadfruit can be mixed with coconut milk to make a delicious flavour and that version of this dessert is found on most food menus at resorts and beachside cafes. This fruit is also typically combined with other ingredients such as butter or sugar, cooked under an open fire and then served. But because the flavour goes so well with many other fruits you can find the breadfruit many different ways so make sure to taste test more than just one. Jamaica is the perfect destination for all things food! If you’re planning on dining with the locals of the island they take their food very seriously. Typical lunch and dinner sittings are very large meals and last for at least an hour each.